Wittgenstein, once a county (pop. 29,264 in 1959) in the province of North Rhine-Westphalia and later merged with Siegen to form the district of Siegen-Wittgenstein (pop. 295,787 in 2001), in the 18th and 19th centuries a principality ruled by the counts of Sayn-Wittgenstein. For the small Amish Men­nonite congregation here, see Waldeck. , . "Wittgenstein (Nordrhein-Westfalen, Germany)." Global Anabaptist Mennonite Encyclopedia Online. 1959. Web. 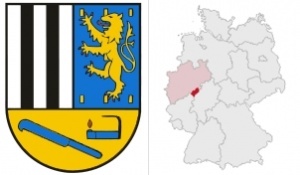 20 Apr 2019. http://gameo.org/index.php?title=Wittgenstein_(Nordrhein-Westfalen,_Germany)&oldid=96896. , . (1959). Wittgenstein (Nordrhein-Westfalen, Germany). Global Anabaptist Mennonite Encyclopedia Online. Retrieved 20 April 2019, from http://gameo.org/index.php?title=Wittgenstein_(Nordrhein-Westfalen,_Germany)&oldid=96896. Adapted by permission of Herald Press, Harrisonburg, Virginia, from Mennonite Encyclopedia, Vol. 4, p. 969. All rights reserved.